The above-average snowfall and potential for significant rain events this spring could present challenges during the upcoming planting season. These conditions, on top of excessive soil moisture last fall that may have led to compaction and soil damage during and following harvest, have farmers concerned about completing spring tillage, fertilizer and planting operations in a timely manner. However, it is important to determine soil moisture conditions before getting in the field this spring in order to avoid additional damage to the soil and hurting future production. It is important to take time to evaluate field conditions early in the spring, especially the soil moisture status. Use the information in Table 1 to estimate soil moisture levels. When soil is dry enough to be tilled, a ribbon of soil pushed out between the thumb and index finger will break before it reaches 5 inches in length. Likewise, soil made into a ball will break apart when thrown into the air. If the soil is too wet, it is more "plastic" and fails these tests. Note that soils with different textures respond differently to moisture. Clay loam and silty clay loam textured soils create more tillage challenges during wet years than soils with less clay content (e.g. silt loams, loams, and fine sandy loams) since water infiltrates coarser textured soils more quickly when the soil is not saturated. Under wet soil conditions, heavy tractors can cause soil compaction. Once the soil is compacted, tilling the soil leads to the formation of non-uniform, large-sized soil clods that negatively impact seedbed preparation due to a lack of soil uniformity, which prevents consistent planting depth and seedling emergence. The likelihood that soil compaction took place during the last harvest is very high. It is important to assess if fields have soil compaction, and the best time to do that is early spring prior to any practice to remedy or correct the problem. Use a soil penetrometer or steel rod pushed to a depth of 3 ft deep to determine the level of compaction by level of resistance. Wet conditions during spring are ideal for detecting soil compaction. Measuring soil compaction when soils are dry can provide misleading results. After conducting the assessment, potential corrections can be entertained. Tillage is often viewed as the solution for alleviating compaction. However, tillage for correcting soil compaction is actually not the best choice, especially in wet conditions. Tilling while soils are wet can worsen soil compaction by destroying soil structure. In fields with deep ruts and cuts on the surface, light tillage when the soil surface is dry can be used to level these areas. It is important to determine the nature and depth of soil compaction. Compaction near the surface (within 3 to 6 inches) is generally associated with excessive surface pressure. Compaction at deeper depths is primarily associated with axle (tractor or heavy implement) weight. If soil a foot below the surface is at field capacity and the tractor's axle load is 7 to 8 tons or greater, compaction can occur at this depth despite lower surface pressures. Soil compaction reduces pore size in the soil (by "crushing" soil aggregates), therefore reducing surface water penetration into the soil profile compared with non-compacted soils. As a result, surface water runs off causing soil erosion, and this runoff carries sediment, organic matter, nitrates, phosphorus, other nutrients, and pesticides to water bodies. Try waiting for soils to dry before starting field work, but watch the calendar. For the southern three tiers of Iowa counties, the corn planting window to achieve 98% yield potential is April 17 to May 8. 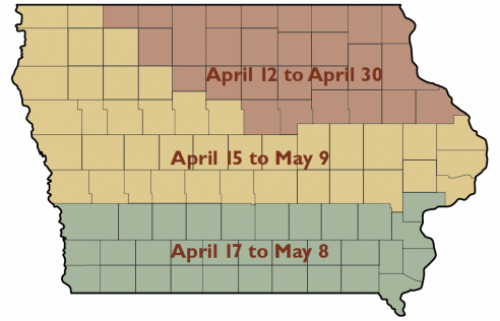 For the central two tiers of counties and northwestern Iowa, this window is April 15 to May 9. Much of north central and northeastern Iowa has a window of April 12 to April 30. Corn planting window to achieve 98% yield potential (Corn and Soybean Field Guide, IPM 0001, 2016). Some possible solutions to the problems associated with wet soils include minimizing or eliminating tillage. To switch to a minimum tillage plan, perform only those tillage operations that are necessary, for example, field leveling, weed control, or fertilizer incorporation. If seedbed preparation times become too compressed, producers can establish a crop with little (field cultivate then plant) or no-tillage (no-till planting). Using wet conditions as an opportunity to minimize tillage, especially if you are planting soybean, or take a break from continuous corn and plant soybean, where research has demonstrated no real benefits or yield advantage for soybean with tillage. Wet conditions also may cause delays for those who have not applied nitrogen. Nitrogen application by itself should not compact soil; however, the tractor pulling the applicator may compact the soil. Because of the risk of compaction and a high likelihood of ammonia loss (due to poor soil coverage/closing after application), the best strategy for nitrogen application is to wait until soil conditions are workable to avoid soil damage and significant nitrogen loss. Wet springs happen. But a careful evaluation on a field-by-field basis and some modifications of tillage and planting strategies and equipment will help in dealing with wet-cold soil conditions. Equip planter with residue cleaners or fluted coulters to help warm the top few inches of soil. In addition to managing wet conditions this spring, it is important to consider long-term management strategies to minimize the effects of similar future soil conditions summarized in an earlier article (Managing Wet and Cold Soils). Table 1. Guide for judging how much moisture is available for crops according to soil texture. * Value represents the inches of water contained in the upper foot of the soil profile. Links to this article are strongly encouraged, and this article may be republished without further permission if published as written and if credit is given to the author, Integrated Crop Management News, and Iowa State University Extension and Outreach. If this article is to be used in any other manner, permission from the author is required. This article was originally published on March 14, 2019. The information contained within may not be the most current and accurate depending on when it is accessed.